The day has finally come! It's time to reveal what I created with the goodies from my partner, Kathy of Bay Moon Design. First, let me remind you what the challenge was. This blog hop is for members of the Bead Peeps Facebook Group. Those interested are assigned a partner. 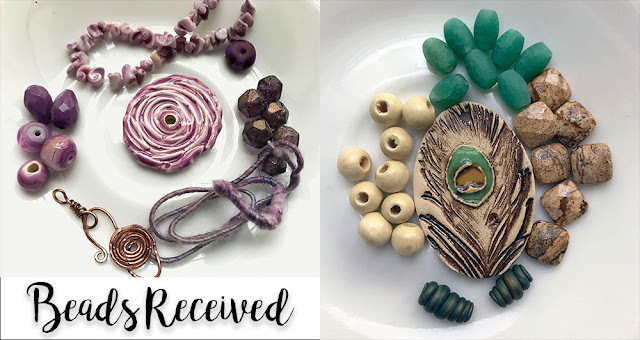 Each person sends his/her partner at least one artisan component - be it a bead, focal, or clasp; and at least one other of the component types that correspond to the artist-made piece. (Though, most everyone sends way more than that!) Then, we create! Our creations must include the art piece. Well, let's get to it! Here's a reminder of the beauties that Kathy sent me. You may recall that she gifted me with two whole palettes with which to work. So much yumminess. Her note said that she couldn't wait to see which one I picked - I picked both! My gut reaction drew me to the ultraviolet palette first with the focal from Marsh Neal Studio. Kathy also included Wooley Wire which I was itching to use, especially since I didn't use the bit I received from my partner, Kari, in last year's swap. Additionally, I was drawn to the beautiful copper clasp handmade by Kathy herself. In Kathy's pictures, she included the clasp with the other palette, but I was compelled to use it with the ultraviolet pieces. Here's what I came up with. It's really a simple necklace with a bit of a spiral-theme. With the spiral-ish shape already in the focal, I created another at the center with the Wooley Wire to make a bail for the donut-shape. Copper coin beads with spirals on them that just happened to be in my stash continued the theme. I also used two of the large violet beads Kathy sent. (My original post called them ceramic, but they seem to be glass.) The majority of the chain is made of alternating 4mm violet and copper beads that are wire wrapped to one another on antiqued 22 gauge copper wire. The necklace closes with Kathy's hook clasp that also happens to have a spiral on it. I have to admit that I have a thing for spirals. Oh, and the focal still turns in the bail I created so it's a bit of a fidget necklace. Fun, right? Now for the not-so-fun part. Next, I turned to the beautiful peacock feather from Firefly Design Studio. Before I reveal any pictures though, I have to reveal the disaster that occurred. After completing my pieces, I placed them in a bowl on the side of my desk so I could easily transport them to the window to take pictures. Before I could get the pictures taken, the bowl was knocked to the tile floor in my craft room. That amazing focal broke into four pieces. I was heartbroken. I'm still heartbroken. 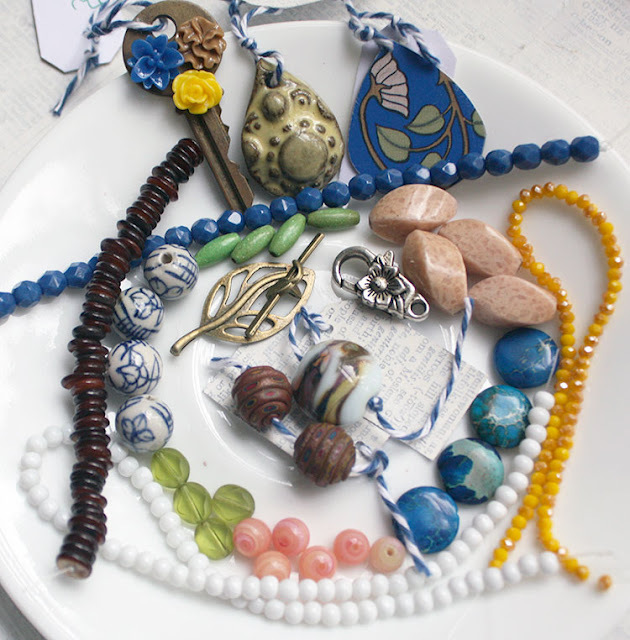 However, I wanted to reveal what had been and attempted to glue those four pieces together to re-assemble the necklace. Here it is in its post-disaster state. I'm SO SORRY! I ended up not using any of the coordinating beads Kathy sent. 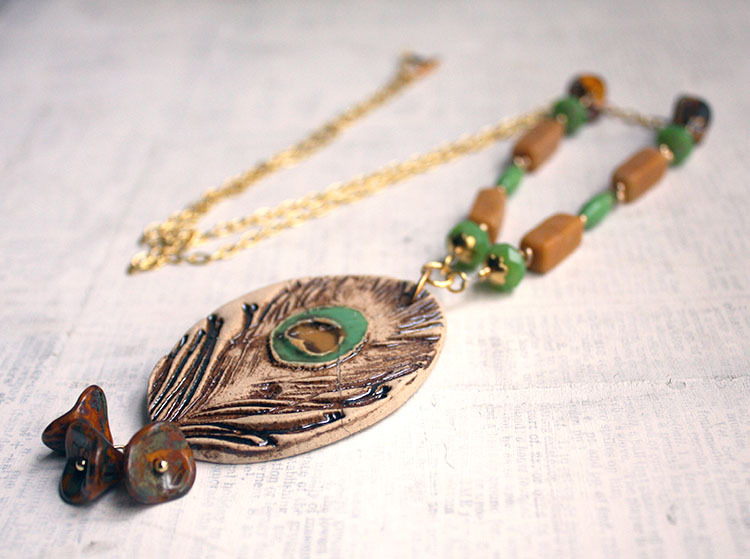 Instead, I found green faceted glass beads and mustard yellow stones that matched the eye of the feather perfectly. 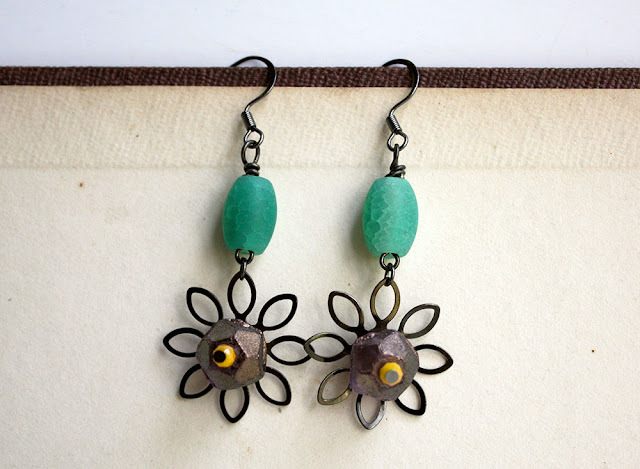 And, the Czech glass flowers I unearthed also have all the same shades as the focal (if you look close). Gold accents were added. 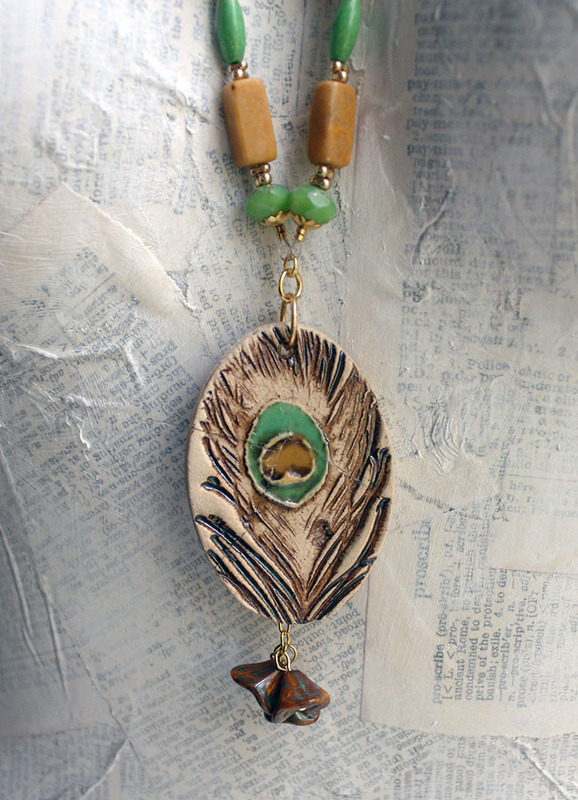 I used the beads sparingly, wanting the feather to be the centerpiece, and completed the necklace with gold tone chain. The Czech flowers are hanging from chain that's attached to the jump ring for a simple accent. Can you see the cracks? I could cry all over again. Sometimes I'm far too clumsy for my own good. I guess this necklace is mine now though. So, that's a bright side at least. After completing the two necklaces, I still had loads of beads. And, the gorgeous purple beads with the gold luster were simply begging to be used. I paired them with green fire agate barrel beads (from Kathy) and yellow Chinese crystals (ZnetShows.com from my stash). As well, I used gunmetal flower accents. 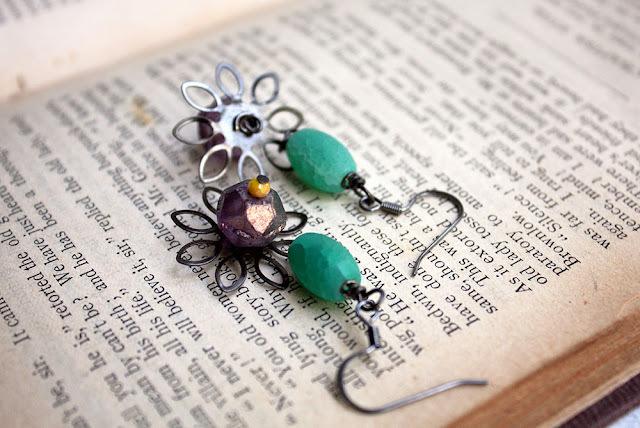 I love that I was able to incorporate both of the palettes Kathy sent into these earrings. And, they're so perfect for Spring. There were difficulties in getting them just as I had envisioned. But, after several tries, I was able to wrap the ends of the headpins in a spiral on the backs to ensure that they stay tight on the petals. After that, they were perfect! I have plans with some of the other beads that Kathy sent. Though, even with the extended deadline, I just couldn't get to them. I'm excited to see what Kathy does with the beads I sent her. Here's a reminder. Don't forget that this is a blog hop and there are loads more links to click and inspiration to be found. You can find the full list below. Such fun stuff you had to play with. 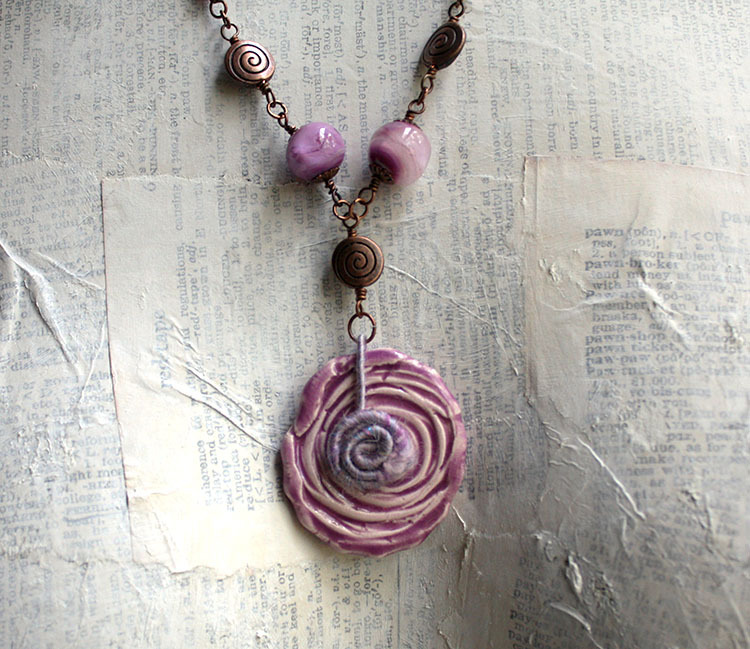 I especially love that lavender necklace....purple is one of my favorite colors. I love how you linked the beads with copper wire. Terry, I indeed was spoiled by Kathy. I'm so glad you like the necklace. It was fun to create for sure. And, I love, love, love making beaded chain from wire. It's my thing. I have such a hard time turning to pre-made chain sometimes. This was one of those times. 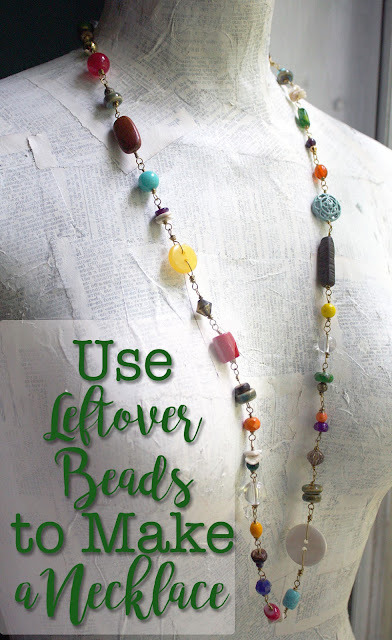 It's really just an excuse to try to use up some of my bead stash! Ha! Hi Hope. Even though I am not a purple girl I found myself very attracted to your first necklace. You carried out the spiral theme to perfection. The peacock necklace is beautiful too. Not a purple girl!? WHAT does that even mean!? Ha. I understand completely, I'm not a pink girl but do find myself strangely attracted to some pink pieces too. Thank you so much for hopping by and for your sweet words. Much appreciated! Yes, the pictures of the front are very deceiving. I might add something to the back to secure it even more. Selling it was definitely out of the question the moment it broke, but I worked so hard on it - I had to share it. And, will likely wear it too. Thank Divya!! I can feel your pain, I would've lost it completely! You're a hero for finishing the design and it was definitely worth it, I like the little flower dangles! The spiral theme is so well made and continues through all the segments - very ingenious! GORGEOUS! 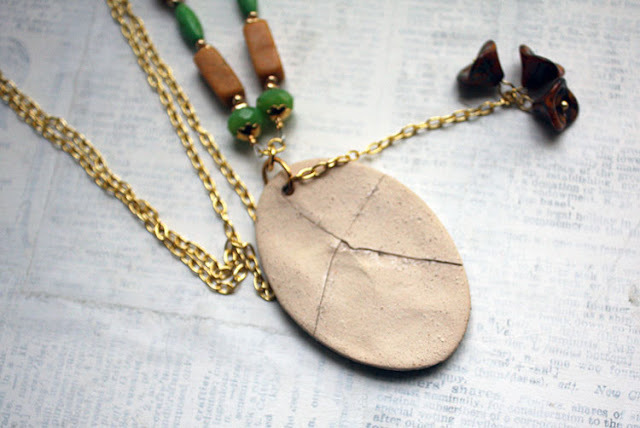 I love both designs and I can so relate the mishap and breaking a beloved pendant...been there done that. But the repair job is a good one and honestly I'd keep it for myself and wear it lovingly...I've done that too! Aw, thank you Kari! There's definitely no way I could sell that necklace in the shape it's in now, but wearing it as my own feels right. I know that it's solidly together, but can't bear to have someone else give me money for something I know is broken. I'm just so mad at myself over it. But, I know I'm not the only one who's gone through this. Thank you for you kind words. Hope-I am so sorry to hear that the feather ceramic broke. I know how painful that is. We have ceramic floors in the Keys and have broken a ceramic on them before. You did do a great job repairing it. Wear it proudly or consider a new ceramic from Firefly Studio. It is a pretty necklace. Your earrings are an engineering feat. I always admire a design where a bead is built from a number of other beads. 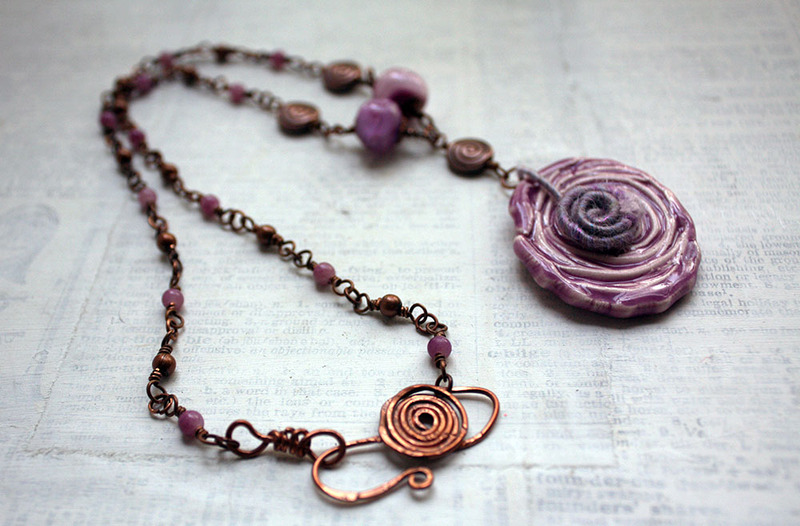 Your purple necklace is wonderful with the copper elements and clasp. Great color choice. The chain you made is pretty with it. It is my favorite since I just adore purple. Kathy, I'm sorry the pendant broke. I'm sure you put time into picking it out and the beads to go with it, and I go and drop it! Yes, our tile is ceramic too and just harder than the pendant was I guess. I'm lucky that the other one didn't break too. I think the wooley wire helped protect it! I'm so glad you like my pieces. I had so much fun working with the components you sent and know that I'll have fun with the rest when I get a chance. It was great being partners with you! Deborah, It's such a shame it broke, but I was able to wear it most of the day today. And I think I might coat the back with resin as Divya suggested. It'll at least make feel more secure about it. Love both necklaces especially since there are doodads to play with and I am always playing with my longer necklaces. And those earrings using both color schemes are perfect for summer. And I can so relate to breakage. As I was gathering up everything after taking pics, I dropped the bag I had everything in and one of the ceramic dangles broke. Love the pink necklace .fab design! Your earrings are cute too. Well done! Thanks so much Fay! I always love a good challenge. Hope! That pooor little feather! I HATE when that happens! You DID make lemonade, and came up with an OUTSTANDING piece, regardless...and now..it has a story! =) Holy moly I LOVE those earrings with the flowers, too! They are juuust my style - sweet, cute and flowery. =) GREAT work! Linda, I'm so glad you like these pieces. I had a wonderful time being partnered with Kathy. She indeed challenged me, but in such a good way.